I never really know what to say when I meet famous people. It’s awkward. I mean, we’re complete strangers, but I often know weird and interesting facts about them – that seems uncomfortably invasive. For actors and writers, I’ve now settled on a simple autograph moment, “I enjoyed your work; thanks for sharing.” It’s one thing, however, to appreciate skill, but another to appreciate genius. I’m going to define genius as someone who blends multiple, unrelated skills into a single package that seems marvelously and magically unique. Paul Reed Smith visited The Seattle Guitar Store in July 2015. I heard in person some of the stories I’d watched online. When it was my turn to get my guitar signed, I was so beside myself that I put my guitar case on the counter upside down. Why? I’d been reading about PRS Guitars since I was young, long before I could afford one, and here I was meeting The Man Himself – and he is a genius. His guitars are, literally, like nothing else I’ve ever played or heard. It’s just not the wonder that are his instruments, it’s the unusual blend of skills that got him to where he is. What makes Paul Reed Smith a genius? It is abilities and skills he both possessed and developed. He started repairing guitars and determined his passion was to build them. It’s not enough to just build guitars, you have to sell them. He developed sales skills, pitching them to artists, with his big break coming up when Santana bought one. To be able to scale meant learning about manufacturing and the business of manufacturing (“If you make 8% in manufacturing, you’ve had a pretty good year”). He became an expert in marketing, creating a set of differentiated product price points for every budget. He sought mentors in the great builders of guitars to perfect his craft. He became a better musician along the way, providing even more insight into making guitars. Most of all, the thing that sets him apart from other luthiers, is that he is an engineer and a scientist. His quest is to understand what makes an instrument great, to know what physical qualities make an instrument special. He creates a hypothesis, tests against it, and incorporates what he learns. Year over year, you can see the evolution in the resulting instruments. I’m passionate about clever engineering and, as far as I know, that engineering skill is unique among guitar builders. Musician, manufacturer, engineer – an unusual combination. His passion was building guitars; his genius was in building them better at scale, creating a $40M company renowned for quality and sound. He did it by constantly learning, constantly improving, constantly developing new skills. What does integration of all those things looks like? Look at the guitar on the right. Beyond the masterful photography that highlights its beauty, it is an amazingly figured piece of maple that is unlike any other I’ve seen – look at how the grain on the horn points to the center. 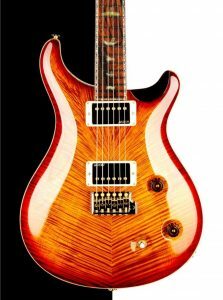 Why are PRS guitars almost “too pretty to play”? I can nearly hear Paul Reed Smith’s thoughts: If you see it, and it’s pretty, you’ll want to pick it up. If you pick it up, you’ll want to play it. If you play it, you’ll hear the sound. If you hear the sound, you will buy it. It starts with how it looks. If you have any doubt, watch Rob Chapman try to talk himself out of a guitar that sounds wickedly good in his hands… because of the looks! Paul Reed Smith got it exactly right. I write about project management, but to be successful, you are going to need to do and be more. Although it’s said that project managers don’t need to be subject matter experts, to have a career, it’s essential to think of the full range of talent and skills you bring to the table. What insights do you have that make you unique? What can you dive into deeply to provide value? What new things will you learn to maintain marketability beyond your employer? What synthesis of things make you a genius? Answer those questions and maybe your next introduction to genius won’t be awkward, because you’ll look in the mirror and that genius will be you. When is an Open Floor Plan Good for Business? Copyright © 2017 DeLaOsa & Associates, LLC, All Rights Reserved. Powered by WordPress	| Theme: Blogi by CantoThemes.